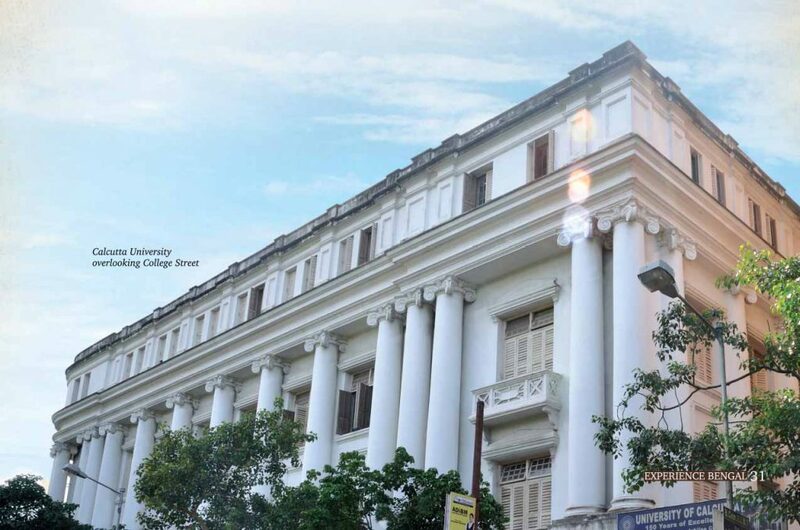 The University of Calcutta is one of the first institutions in Asia to be established as a multidisciplinary and secular western style university and it often lures us to delve into its origins. Every nook and corner of the great institution is filled with nostalgia and memories of students and history of the institute’s inception. Students of this elite institution brim with aspiration, confidence and ambition. Some of the Nobel laureates who have been associated with this university are – Ronald Ross, Rabindranath Tagore, CV Raman and Amartya Sen, to name a few. The University of Calcutta was founded in 1857. The plan had initially failed to obtain the necessary approval of the British Government. A proposal to establish two universities, one in Calcutta and the other in Bombay, was later accepted in 1854. The Calcutta University Act came into force on 24 January, 1857 and a 41-member Senate was formed as the policy-making body. ‘The university started having affiliated institutes covering an area from Lahore to Rangoon (now in Myanmar), by far the largest of any Indian university ever’. ‘The first Chancellor and Vice-Chancellor of the Calcutta University were Governor General Lord Canning and Chief Justice of the Supreme Court, Sir James William Colvile, respectively. The first graduates of the university were famous personalities like Jodu Nath Bose and Bankim Chandra Chattopadhyay’. Many colleges and institutes eventually came under its jurisdiction. ‘The first female graduates were Kadambini Ganguly and Chandramukhi Basuin in 1882. Justice Gurudas Mukherjee became the first Indian Vice-Chancellor of the University of Calcutta in the year 1890. Sir Ashutosh Mukherjee was the Vice-Chancellor for four consecutive two-year terms from 1906 to 1914 and a fifth two-year term from 1921 to 1923’. Students have often expressed dissenting opinions as an exercise to establish their freedom of speech and expression. The bright students march along the harrowed halls that echo with the enchantments of the eminent faculty, as a democratic art. The stairway exhibits the portraits of the great beings who were once students there. Calcutta University has been an Alma Mater to many historical personalities. Some of them are- Bankim Chandra Chattopadhyay, Subhas Chandra Bose, Ashutosh Mukherjee, Shyamaprosad Mukherjee, Jibanananda Das, Satyendranath Bose, Bidhan Chandra Ray, Prafulla Chandra Ray, Kadambini Ganguly, Meghnad Saha, Chandramukhi Basu, Nabin Chandra Sen, Kamini Roy, Sukumar Ray, Rajendra Prasad and Narendranath Dutta (Vivekananda). The Syndicate of the Calcutta University started functioning in 1858. The first Entrance Examination of the university was held in March, 1857 at the Town Hall. Calcutta University has provided students with outstanding teachers who have inspired the nation. It has also been the place where friends used to meet and make some wonderful memories, to be cherished throughout their lifetime. Presently, the university has 65 departments and 14 campuses spread over the city of Kolkata and its suburbs. The first university library started functioning in the 1870s. Apart from 39 departmental libraries, it has a central library, two campus libraries and two libraries of the advanced centers spread across the campuses. Students of affiliated colleges can also access the central library. The university library has over one million books and more than 2,00,000 journals, proceedings and manuscripts. Calcutta University has always been and remains an institution that has been recognized all over the world. ‘It was the first university located in the east of the Suez to impart European classics, English Literature, European and Indian Philosophy and Occidental and Oriental History. The University of Calcutta is a public state university. It was the first institution in Asia to be established as a multidisciplinary and secular Western-style university’. The journey of university students is indeed a joyous one and aside the degree of academic excellence offered to them, they recount memories and experiences that are a part and parcel of the culture of the Calcutta University’s way of learning. Breakfasts at ‘Putiram’, the iconic eatery just round the corner, tea at ‘Basanta Cabin’, a stroll around ‘College Square’, book-buying at ‘Boi-Para’ and evening dates at ‘Paramount’ renowned for its Sherbets, are few of the fondest of memories for many students and visitors. 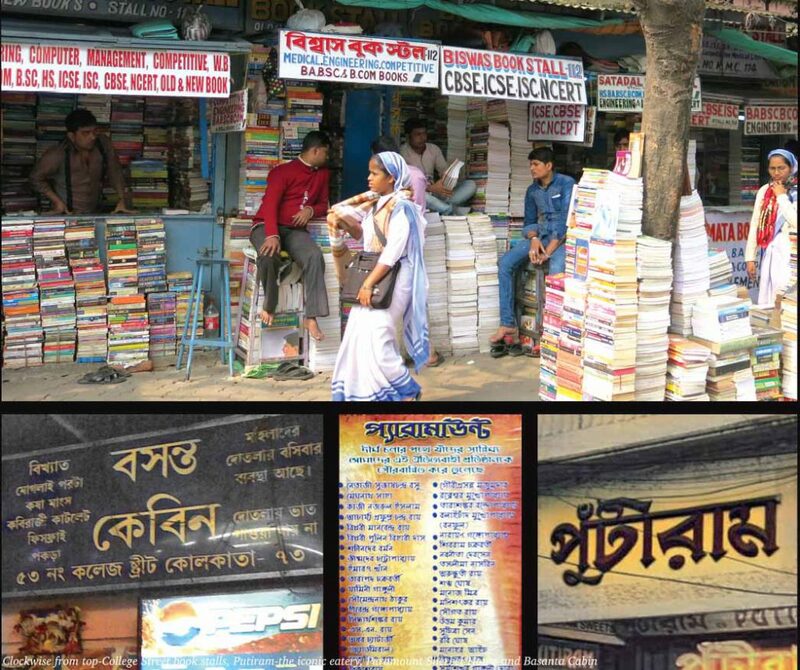 The bookstalls at College Street outside the university premises never failed to satiate the curiosity and quench every bibliophile’s cravings. The University also marks the ground where leaders were born. Representative Politics, Unions, Clubs and Committees throng the campuses till date. There can be no comparison to the politics of revolution, as was seen here prior to independence and the petty party struggles of the present political landscape and untoward external interferences. But then, Calcutta University Student Politics has given us great leaders like Subhas Chandra Bose and Shyama Prasad Mukherjee. Democratic chants, class struggle and freedom have always echoed within the pillars of this institution that championed the cause of the freedom of speech and expression. Calcutta University will always continue to further the development of our country by providing her with great sons and daughters who shall facilitate growth and create a modern India that leads the world. i) The first medical school in Asia, Calcutta Medical College, established in 1835 got affiliated to this university in 1857.
ii) Campuses – The university has total of 14 campuses throughout Kolkata and its outskirts, the major ones being Central Campus in College Street, Rashbehari Shiksha Prangan in Rajabazar, Taraknath Palit Shiksha Prangan in Ballygunge and Sahid Khudiram Siksha Prangan in Alipore. iii) Well known personalities associated with this university are Academy Award Winning director Satyajit Ray, author Bankim Chandra Chattopadhyay, industrialists like Sir Rajen Mookerjee, Rama Prasad Goenka, Lakshmi Mittal, Aditya Birla, scientists and mathematicians like Jagadish Chandra Bose, Prafulla Chandra Ray, Meghnad Saha, Anil Kumar Gain, Satyendranath Bose and Ashoke Sen. Leader of the Indian National Congress and co-founder of the Indian National Army Netaji Subhas Chandra Bose passed his BA in philosophy from Scottish Church College, affiliated to Calcutta University. iv) Presidents of India who have studied or taught at colleges affiliated to Calcutta University are Rajendra Prasad, Sarvapalli Radhakrishnan, Pranab Mukherjee and current Vice President of India – Md. Hamid Ansari.